Exclusive to SilverCrow Creations! is our stylish charm bracelet. 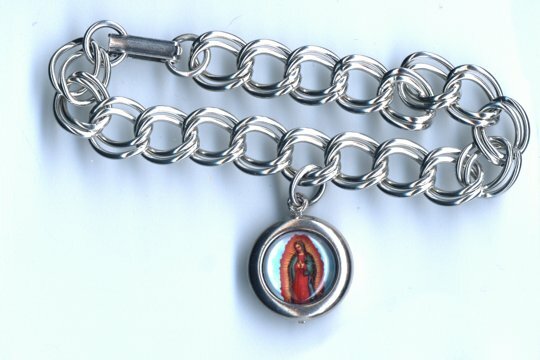 Fashioned with a single 33mm double sided charm featuring Nuestra Virgen de Guadalupe, the bracelet's links enable you to add additional charms or medals. 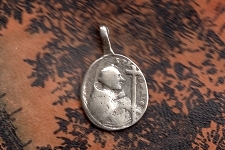 Equally stunning with jeans or a suit, the timeless image of the Virgin compliments any wardrobe. The charm itself is set in a bezel of white metal plated with antiqued sterling silver plate and attached to a 7-1/2 inch chain. An actual image is encapsulated in a washable, dry-cleanable, non-yellowing and non-scratch resin - creating a glowing almost 3-D effect.